UPDATE: Fueling has begun at T-minus 90 minutes. CAPE CANAVERAL, Florida - SpaceX is poised to make space history once again with the launch its Falcon 9 Heavy rocket carrying a midnight cherry Tesla roadster into a Martian solar orbit. The most powerful rocket since the Saturn V lunar missions is scheduled to liftoff at 3:45 p.m. Eastern Standard Time on Tuesday, February 6, 2018, from Launch Complex 39A at the Kennedy Space Center in Florida. The launch was pushed back from 1:30 p.m. due to high winds. The launch window remains open until 4 p.m. According to the latest forecast from the U.S. Air Force 45th Weather Squadron, there is an 80% chance of favorable weather for the launch. The primary concerns are liftoff winds and thick clouds. 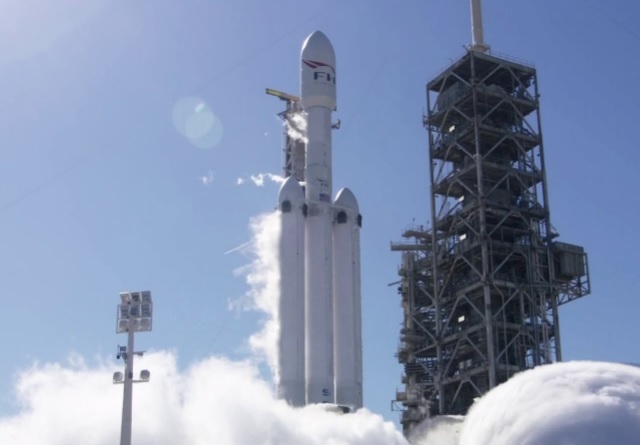 After first booster separation from the core, SpaceX will attempt to land two Falcon Heavy booster rockets on land at Cape Canaveral Air Force Station’s Landing Zones 1 and 2. Landing Zones 1 and 2 are built on the former site of Space Launch Complex 13, a Cold War-Era U.S. Air Force rocket and missile testing range last used in 1978. Residents of the communities of Cape Canaveral, Cocoa, Cocoa Beach, Merritt Island, Mims, Port Canaveral, Port St. John, Rockledge, Scottsmoor, Sharpes, and Titusville, Florida, are most likely to hear a sonic boom, although what Brevard County residents experience will depend on weather conditions and other factors. Following stage separation, the core rocket of the Falcon Heavy will attempt a landing on the Of Course I Still Love You autonomous drone ship downrange in the Atlantic Ocean.